A new 800-page study released by the Public Lands Policy Coordinating Office argues that Utah could afford the management costs that would come with acquiring the more than 30 million acres of public lands the state has been hoping to gain control of. 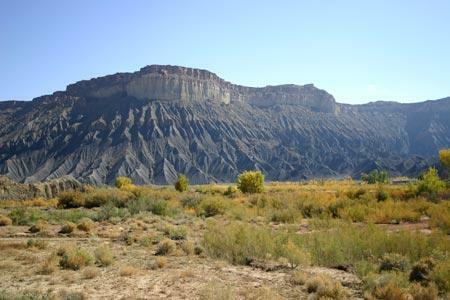 A new study suggests that Utah could make money by acquiring federally-held lands in the state. Governor Gary Herbert, along with other Utah lawmakers, has been pushing the Federal Government to hand over ownership of the property, which makes up more than half of the land in the state. A bill passed in 2012 cited the 1894 Enabling Act and demanded the federal Government hand over the land by 2015. One issue those opposed to the federal land acquisition have brought up is the prohibitive cost of fighting wildfires on additional land. According to one count there were 769 fires in the state between the first of the year and the beginning of August. USU Professor Michael Kuhns explained that fire has become a growing problem in the state because of climate change and invasive species such as cheatgrass. “If we have drought, which we’ve had, then that makes fires potentially bigger and more severe and more intense," Kuhns said. According to the study, annual fire suppression costs averaged around $33.4 million a year. The study suggests that with the large-scale land transfer the state could expect to pay an additional $76.7 million, bringing the yearly total to approximately $110 million. In total, the study predicts the cost of state management of transferred lands would be $248 million dollars by 2017; however, it also points to several potential revenue streams from the lands including mineral and gas deposits, timber and coal royalties that could outweigh the costs. Researchers conclude that if a transfer does happen, which remains uncertain, a strain would be put on the state’s funding priorities as it adjusts to the loss of federal money it currently receives and develops programs now managed by the federal government. PLPCO was created by the state legislature to develop and coordinate the state’s public lands policies. Researchers from Utah universities, including Utah State University and the University of Utah were involved in the study.